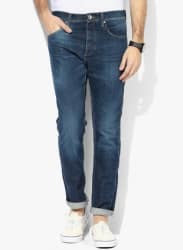 You will look smarter and trendier than ever wearing these navy blue jeans from SELECTED as you gear up for a get-together. The cotton fabric of this pair of jeans will provide you outstanding comfort throughout the day. Team these slim-fit jeans with a printed T-shirt and a pair of sneakers to complete your cool look.